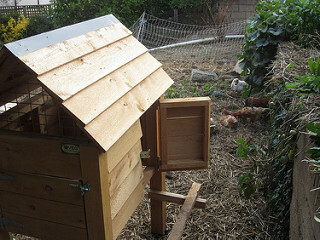 Backyard chickens are a win-win, and there is nothing like a few chickens in your yard to increase the amount of food you can grow. 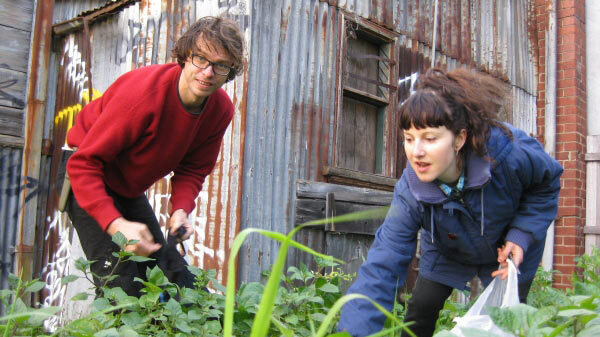 It’s not just the eggs and the wonderful company, but the free fertiliser and pest-control services that mean chickens boost your urban farm status up many levels. 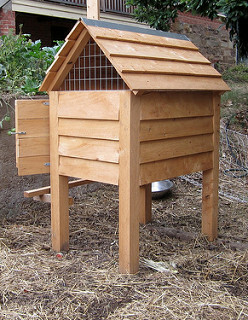 You can also offer some chooks a great life, far away from the cruel conditions of overcrowded barns or cages. See here if you need a hand to convince your family members that chooks are a goer for you. You can see a short clip of one of our large chook houses and a standard strawyard installed here and another (custom-fit to a steep site) here. 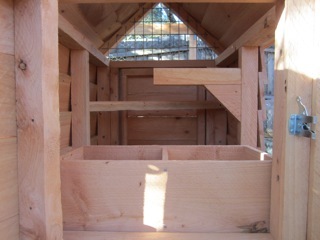 Measuring 1150mm long by 900mm wide by 1600mm high, our small chook house sits 550mm above the ground on four posts and will comfortably house up to four chooks (or five little ones). Probably our favourite feature is having the chook manure drop straight through the chook house floor onto waiting straw, woodchips, or even a wheelbarrow for easy transport to your veggies and fruit trees. It just makes sense. 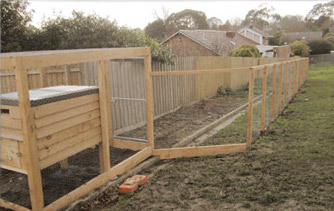 We can either build our chook houses in our Brunswick warehouse then transport them to your site by trailer and help get them in place, or you can pick them up by appointment. Measuring 1450mm long by 950mm wide by 1650mm high, our large chook house sits 550mm above the ground on four posts and will comfortably house up to eight chooks. 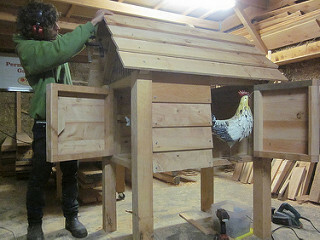 Note: We will happily custom build chook houses in smaller or larger sizes as required, or with extra doors etc. 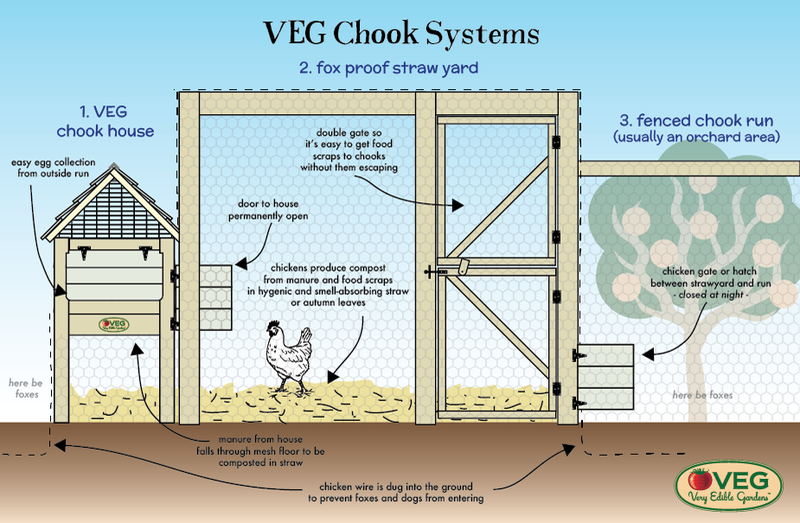 100% fox-proof and custom-built to any specifications, our straw yards adjoin or include the house and we use solid cypress posts and beams and an innovative double door and hatch system to let you control the movement of the chooks without any chaos. You can read a bit about why straw yards are just such a great part of any chook system here. We see so many flimsy houses and pens that fall apart after a year or two that we’ve been moved to build something solid and functional that will last many, many decades. We run cypress batons along the top of the fence for a cleaner finish, tighter wire, and a nice ledge to lean on and admire the chooks. Contact us for a quote. The answer, our friends, is to have both. Chooks and orchard systems are completely complimentary. 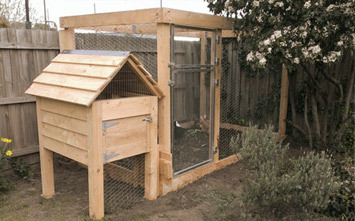 Chooks suppress grass, provide pest control and fertilise your orchard, while the orchard provides your chooks with shelter and all the excess fruit you don’t eat. Contact us to find out how you can save by having your orchard and chooks installed as a single integrated system supplying eggs, fruit and immense satisfaction. If you are not sure about the best way to organise your yard, and need design assistance in siting and organising your system – we can come and perform a design consultancy to make sure you get the most out of your system. Not sure if you can keep chooks in Melbourne? Click here.